I have a fabulous mini album to share with you using Webster's Pages. This album was created by Patty using her family's heritage photos. It is SO beautiful. Be sure to flip through it when you stop in to pick up new CHA goodies! Sounds like Carolyn and Kerri are having a fantastic time rounding up new goodies to fill the store. Here are some more beautiful designs on display at The Crafty Scrapper. Susie designed this Sweet Boy layout using Fancy Pants patterned paper and embellishments. I love the photos. I'm guessing they were making cookies. I need to get on the ball taking pictures this year. Are any of y'all doing the 365 photo project? Darling little banner, and love the font of these alphabet stickers. Happiness is homemade by Susie. I love the expression of her seeing the doll house. What a sweet moment to scrap. That beautiful trim is from Webster's Pages, and the papers and title are from We R Memory Keepers. This gorgeous detailed layout "Classy Lady" was done by Patty, one of the store regulars using Pink Paislee's Sweetness line. It is SO fabulous. She used a ton of techniques to alter her papers. Love how she accented the photo with the Prima flowers bunch. Love how the Artisan Element is accented with this bit of tulle. It looks like a veil. You can see around the photo she created a frame using paint. Love it! All these supplies and designs can be seen in person at The Crafty Scrapper. Hope to see you soon! We hit the ground running on Thursday and it's been a blast! I don't remember the name, but it was really really tasty! Yesterday morning Carolyn awoke (I had been awake since 3:00 Calif time) to a hotel employee blasting an emergency alarm over the room speakers and announcing only "attention hotel guests...". Then he was gone. Poor Carolyn so sound asleep she thought the man was in our room!! Once I convinced her he wasn't we had to find out what was going on. I thought the hotel was on fire, but C was calm until she discovered we had no WATER! That prompted her to call the front desk which of course received no response. In the meantime a firetruck has come and gone. I was ready to head to the lobby, but finally the "emergency response team" announced we were good to go. Then we left for another full day of working with Maya Road. Guess who showed up??? Lucky me got to work right there with her putting together catalog kits! That is also Caroline L's hubby David, who is really amazing to put up with all us girlie girls! And there is Sarah who is on the Maya Road Design team. that she has posted on her blog. Last night after a wonderful Italian dinner we headed to Lisa's room to make flower wristlets. I'll post some pictures of those tonight. Off to do some major buying for you all! Spread your wings using Pink Paislee's Sweetness line. I cut up a journaling tag from My Mind's Eye, and stapled it onto the photo, and layered over it with Pink Paislee and Maya Road embellishments. I painted over the Pink Paislee Artisan Element with Tattered Rose Distress Crackle Paint, and outlined the Maya Road chipboard flower with Cotton Candy Stickles. I added some of my favorite October Afternoon alphabet stickers right over the photo. And I used green Thickers for the rest of the title. Sweet! More to show you soon from Patty and Susie. Are you on our mailing list? You can sign up by entering your email address on the main page at thecraftyscrapper.com or click HERE to see the latest newsletter from The Crafty Scrapper with all the newest classes, kits, and events. Wow! We leave tomorrow! I am so excited I can't even begin to sit still! We loved reading your comments yesterday! I have a couple of ladies I would really like to meet. The first is Heidi Swapp﻿. She has such a vibrant personality and such a positive outlook. Once I sent her an email and she emailed me back!! I thought that was cool that she took the time to reply. I love that she, Janet Hopkins and Rhonna Farrer (I wouldn't mind meeting those two girls either;)) are designing for Pink Paislee now. I would love to meet Teresa Collins too. I admire her family and work ethics. She is very open and honest about her life on her blog. Looks like an awesome boy line! 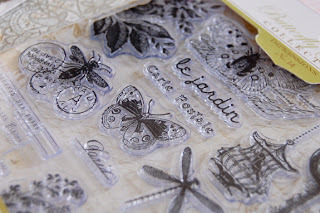 If you haven't check out Tim Holtz's blog yet, you might want to head on over there. He has a lot of fabulous new products! If I don't have time to post again before we leave, check back during CHA. I have another sneak peak for you before I head off to the store. Today's a busy day at TCS, Carolyn has a full class for her 12 Days Tags! What is your favorite company of all? You know the one that you are ANXIOUSLY awaiting a sneak peek of and can't wait for us to get it in the store?? Mine is Pink Paislee. I always love their lines. They have 4 beautiful new lines called Butterfly Garden, Daily Junque (designed by the House of 3 girls), Celebration and Hometown Summer. I love all the little houses companies are using now. Check out this stamp set from the Butterfly Garden. Looks like butterflies will be HOT this spring. PRIMA! Here are a few pictures, but you really need to head over to their blog to see all the beautiful new flowers, ribbons, and the Melody Paper Collection. One more question before I head out. If you were going to CHA, who would you want to meet? I am very happy that I have already had the opportunity to meet two of my faves at the store...Lisa Pace and Katie Watson! I do have a couple more that I admire and love their work. I will share their names and blogs with you tonight...hopefully. This sweet Maya Road mini album was designed by Gena. Don't you love the die-cut page with the outlined letters. Sweet! Sweet birdcage with velvet trim. This cute heart comes in the new Maya Road mini love chipboard set. Love how she stamped tickets over the envelope, and added those cute October Afternoon alphabet stickers. Be sure to check out our FB page, and we've added a button for you to snag on the right side-bar if you want to show off your Crafty Scrapper love. We'll be back soon with more CHA peeks! We will be leaving this Thursday for CHA so I thought we could take a peek at some of the new lines. The web is full of companies proudly showing all their beautiful new products. Here are a couple that caught my eye this weekend. My favorite with Crate Paper is Emma's Shoppe. Have you seen Webster's new Fabric ribbon, whimsies, flowers, stick pins and silhouettes?? I love them all. Go here to see ALL of the gorgeous designs. Check out this cute mini by Jennifer done with the We R Memory Keepers line "Family Keepsake." Great way to use the die-cut strips. Maya Road chipboard frames and flowers. Kraft journaling tags by Maya Road. I created these layouts for The Crafty Scrapper last week. I decided to try 8.5x11 layouts for the first time, and I have to say I'm in love! I love the dusky and smoky hue of the colors of these papers from Pink Paislee and Fancy Pants. I inked and glittered the Maya Road butterfly with Broken China Distress Ink and Stickles. I misted the doily with Pink Lemonade Maya Mist. I love this picture of her big dark brown eyes. And finished it up with these cute stickers from Cosmo Cricket and October Afternoon. This page was made with Pink Paislee's Sweetness line which is definitely my new favorite. I love this picture with her chubby baby cheeks and soft baby curls. I layered some chipboard with a wooden heart embellishment, and tattered the paper strip underneath. You can find all of these supplies at The Crafty Scrapper, and see the layouts in person at the store.